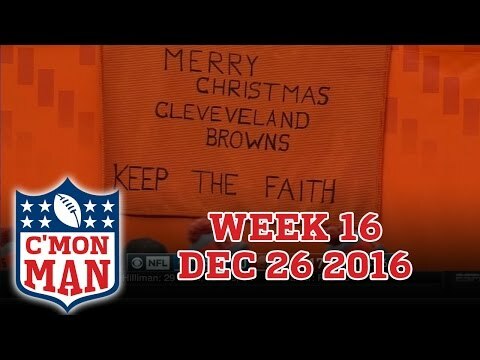 Espn Cmon Man Week 16 12 25 17....! ESPN C'MON MAN! 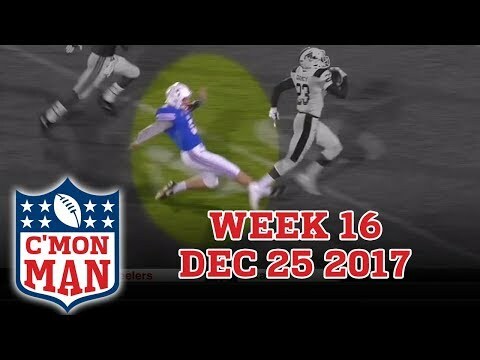 Week 16 for December 25, 2017 1. Brock Osweiler fumbles the ball after getting sacked and he thinks he still has the respect to rally the troops in a rousing sideline speech that no one is listening to. 2. Andy Reid has got everyone beat when it comes to wearing Christmas outfits. 3. At the Birmingham Bowl, an official calls a completed touchdown catch incomplete. Then the net guy can't get the net up for the extra point. Then in the Frisco bowl the kicker tried to trip the runner down, but fails so bad, he can't even get penalized for it. 4. Falcons running back Devonta Freeman slows down yet, the sound guy still falls over as if he was hit at full speed. C'MON MAN!! 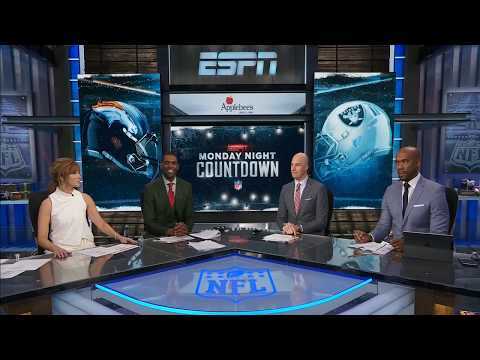 C'mon Man from ESPN Monday Night Football.. Week 14 Dec 11, 2017 Funny clips of weekend bloopers.. The folded paper first down made this one. 01. The fan at the Cleveland game can't even spell Cleveland correctly. But on top of that, the Chargers actually lost to the Browns. 02. 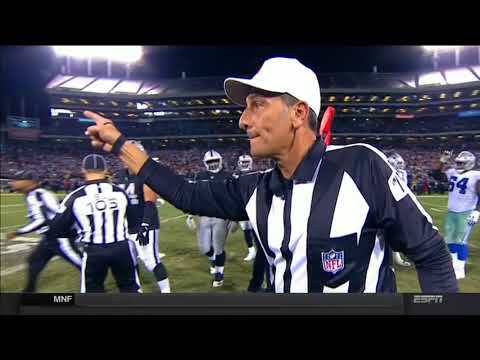 The Jets have appeared on C'mon Man so often, that the refs are laughing at them. 03. The Paatriots were going to run out the clock in the half, but the Jets called timeout. So instead, New England decided to throw the ball downfield and run up the score some more. 04. After the ball falls off the tee when Old Dominion kicks off, Nick Ferrari-Smith is tasked with holding the ball...and it STILL falls off the tee. 05. Packers quarterback fakes out the Vikings defender on the way to the endzone, then held by the Green Bay fan in the stands. 06. Pittburgh quarterback Ben Roethlisberger's press conference gets interrupted twice because the phone was ringing. C'MON MAN!! ESPN C'MON MAN! for Week 15, December 21, 2015 01. Colts punt cover man Winston Guy tries to be sneaky by running WAY out of bounds before getting to the punt returner. 02. 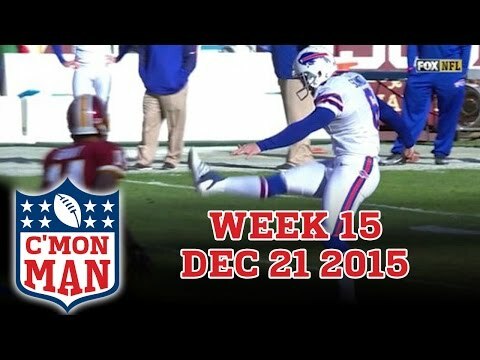 Bills punter Colton Schmidt kicks the worst punt you've ever seen. 03. Christmas fashion around the league. 04. Eagles receiver Jordan Matthews scores a touch down and does his best Rocky impression. To be fair, Rocky lost, right? 05. Some college and pro shenanigans resulting in helmet removal. 06. The return of Andre Boyd's spot on impression of Ray Lewis. C'MON MAN!! !